Warm, comfortable insoles with antibacterial treatment. Goodbye to frozen feet and unpleasant odours. 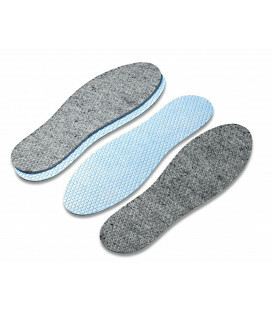 Pure wool insoles that are very warm and comfortable, absorbing unpleasant odours. To keep your feet warm when temperatures drop in the winter. Warm insoles protect your feet from extreme cold with antibacterial agent to fight unpleasant odours. Real slipper-style insoles to slip in your boots for warm feet in the garden or when you are out hunting or fishing.